It's BBQ month and people are firing up their grills! Here is a fan favorite recipe from Weber's Greatest Hits. You can get more recipe inspiration from the book by going here. 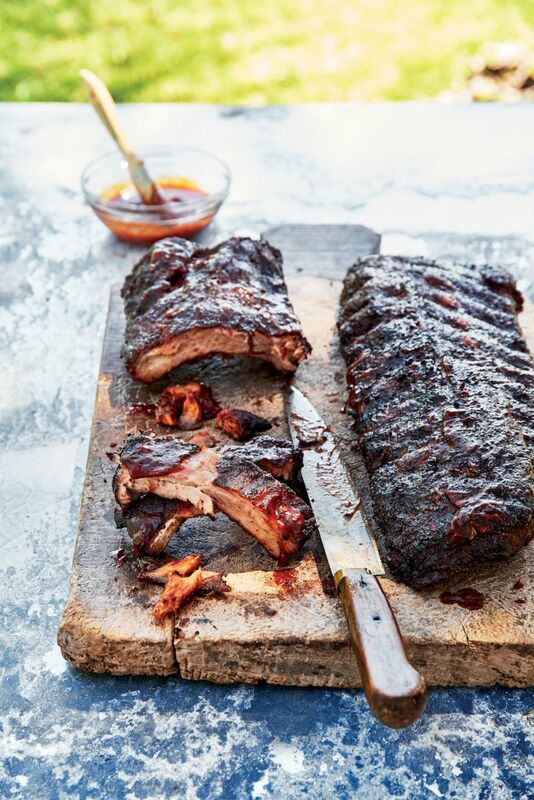 To qualify as “best on the block,” the seasoned “bark” (crust) and natural flavors of the pork ribs must complement the hickory smoke and the sweet-tart sauce. We use some potent spices to accomplish this, but if you prefer milder ribs, add about half the recommended amount of chile powder to the rub and leave the hot-pepper sauce out of the sauce. Before you get started, here are some key tools that will help you acheive great results with this rib recipe. 1. Have a rib rack ready. In a small bowl combine all the rub ingredients and mix well. Using a dull dinner knife, slide the tip under the membrane covering the back of each rack of ribs. Lift and loosen the membrane until it breaks, then grab a corner of it with a paper towel and pull it off. Season the ribs evenly with the rub, pressing it into the meat. Arrange the racks in the rib rack, standing each rack up and facing them all in the same direction. Let the racks stand at room temperature for 30 minutes to 1 hour before grilling. 2. Soak 4 large handfuls hickory wood chips in water for at least 30 minutes. 3. Prepare the grill for indirect cooking over low heat (300° to 350°F). 4. Brush the cooking grates clean. Drain 2 handfuls wood chips and add them to the charcoal or to the smoker box of a gas grill and close the lid. When smoke appears, place the rib rack with the ribs over indirect low heat and cook, with the lid closed, for 1 hour. Maintain the temperature of the grill between 300° and 350°F. 5. While the ribs are cooking, make the sauce. In a medium skillet on the stove, fry the bacon over low heat until browned and crisp, 10 to 15 minutes, turning occasionally. Transfer the bacon to paper towels to drain. Let the bacon drippings in the skillet cool to room temperature. Eat the bacon or save for another use. In a medium saucepan combine all the remaining ingredients except the hot sauce, if using. Add 3 tablespoons of the reserved bacon fat and whisk until smooth. Place over low heat and cook for about 5 minutes, stirring occasionally. If you prefer a spicy sauce, season with the hot sauce. Remove the pan from the heat. 6. Combine the mop ingredients in a small spray bottle. After the first hour of cooking, drain the remaining handful of wood chips and add them to the charcoal or smoker box. Lightly spray the racks with the mop, particularly the areas that are looking a little dry. Close the lid and cook for 1 hour longer. Maintain the temperature of the grill between 300° and 350°F. 7. When the second hour of cooking has finished, lightly spray the racks with the mop, particularly the areas that are looking a little dry. If any of the racks are cooking faster than the others or look much darker, swap their positions for even cooking. Close the lid and cook for another 30 minutes. 8. After 2 1/2 hours of cooking, the meat will have shrunk back from most of the bones by 1/4 inch or more. If it has not, continue to cook the racks until it does. When the racks are done, remove the rib rack from the grill. Close the lid of the grill to maintain the heat. Remove the racks from the rib rack and lightly brush each rack on both sides with some of the sauce. 9. Return the racks to the grill over indirect low heat. At this point you can pile all the racks on top of one another or stack the racks two to a pile. Continue to cook over indirect low heat, with the lid closed, until tender and succulent, 15 to 30 minutes. To test if the racks are done, one at a time, lift them, bone side up, at one end with tongs; if a rack bends so much in the middle that the meat tears easily, it is ready. If the meat does not tear easily, continue to cook until it does. When the racks are ready, transfer them to a platter and let rest for 5 to 10 minutes. 10. Just before serving, lightly brush the racks with sauce again. Cut the racks into individual ribs and serve warm.